When choosing a transmission wavelength, the goal is to send the most amount of data the furthest it will go and with the least amount of signal loss. The loss of signal strength during transmission is known as attenuation. The three main wavelengths used for fiber optic transmission are 850, 1300, and 1550 nano meters. Typically multi-mode glass fibers use light at 850 nm - 1300nm, referred to as “short wavelength” and single-mode fiber operates at 1310, or 1550 nm, called “long wavelength”. 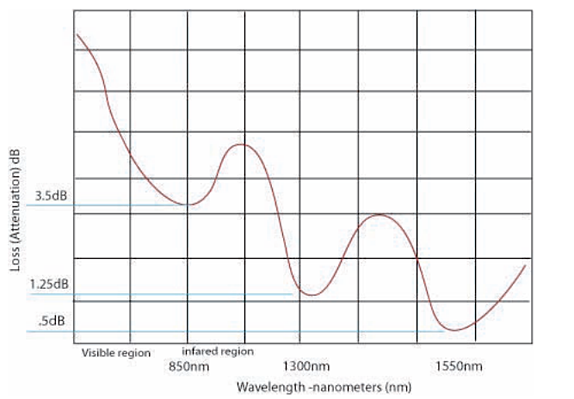 These wavelengths are used because they have the lowest attenuation rate. If you would like to learn more about single-mode vs. multi-mode view this blog article. Other factors that affect transmission quality and attenuation rates are the quality of the fiber materials and the loss of light. There are primarily three windows of opportunity to transmit light effectively through an optical fiber. These specific wavelengths are in the infrared region. 850nm - 3-4dB of loss/km. The least expensive transmitting device. Found on a lower speed, shorter distance applications such as CCTV, fire alarm communication devices. ( LED) Used with multi-mode fibers. 1300nm - 1-1.5dB of loss/km. The second window of opportunity. Used for higher speed, longer distance multi-mode applications. 1310nm is used for single-mode shorter length applications. LED or VCSEL. 1550nm - .5dB of loss/km. This is the second window of opportunity for single- mode transmission. This wavelength is used for extremely long distance high bandwidth applications. If you would like to learn more about fiber optics for any networking application, email us at sales@westpennwire.com. Click the link below to order fiber today and make sure to subscribe to our blog to learn more about fiber optic cables!